EDMONTON — Once a power-puncher, former Edmonton Oilers beat cop Bill Huard is now heavily involved with stopping power outages. Huard, 47, works for the award-winning, Edmonton-based company Cantega Technologies, which has devised an environmentally-friendly way to stop downed power systems in the utilities and oil and gas fields caused by birds and animals. Huard, who had 51 NHL fights over a five-year period and damaged his left hand in a scrap 17 years ago this month with Ottawa’s Chris Murray, which put an end to his pugilistic prowess, has been living in California for years. The road leading to Huard’s current work started when he met Brent Stankowski seven years ago, after Stankowski’s son Carl moved to Los Angeles to play hockey for a youth team that included Huard’s son Colton, now 14, and Huard as a coach. Stankowski and Huard became fast friends, and now Huard, a born salesman, is vice-president of business development for Cantega, which won an ASTech Environmental Technology Innovation award this year. Stankowski is Cantega’s chief executive. Huard, who quit hockey in 1999 and also worked in marketing and sales for sunglasses firm Oakley and as regional manager for a medical device company, is bullish on protecting power sources and wildlife. Huard says there are more than 900 aluminum moulds that they spray. 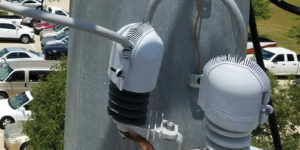 “We go in and assess a whole substation, with schematics, pictures, the whole design. In the U.S., there is $150 billion of lost revenue (power) and $30 billion is animal related. We’re protecting birds and million dollar transformers,” he said. Huard, who was also in the colour commentator field for awhile after retiring, played pro for 12 years. He played 223 NHL games in Ottawa, Edmonton, Quebec, Boston, Dallas and his last stop Los Angeles, with another 389 games in outposts in the minors, too. It was a tough road, looking after people. His wild fight with Murray in Ottawa, off a faceoff, wrecked his hand. “I had four screws and two plates put in … my knuckle was pushed back toward my wrist. I can’t close my left hand completely,” said Huard, who will be here in a couple of weeks to see the Cantega folks and maybe drop by Rexall to watch an Oilers game. Huard has long had ties here and in Alberta, even though he’s lived in Orange County for years. His wife Gaeleen’s sister Connie lives in Edmonton and Gaeleen’s brother Chuck sadly died two years ago driving a big service truck for the oil and gas industry.